This is part two of a series about my personal history with the Forza series. This should be a quick review of F6: Apex and speculation about what it may mean for the next numbered Forza game. As you may have gathered from that earlier post, Forza was the series that got me to care about the more simulational aspects of driving and racing games. And this does need to be made distinct. When I'm playing DiRT Rally, it is an off-road driving game. When I am joining some friends to bash round a track in PGR then it is a racing game. My preference is for the former but I also like a touch of the latter (with AIs or humans - as long as they're not playing bumper-cars, doing anything crazy that can't help anyone in a sim-style game) to spice things up at times. And Forza, Forza gives me both. By the time I'd stopped throwing dozens of hours into each game in the series, I was driving an automatic with no vehicle assists and the braking line to jog my memory of each track and provide per-car guidance, cockpit view with each speaker talking to me about each wheel I needed to keep on top of. The AIs in Forza 4 and Horizon were pushed up to the top tier but my main interest was in finally breaking past the front AI and getting some clean air to compete with my Car Club for the leaderboard of clean laps in the car class. Earlier events in the career provided more time to get precise with the controls and demands of the tyres, later events generally provided longer races and so the same opportunity to get some clean laps before the end, even with more challenge handling the cars and getting out in front. Being a cut-down version of the main Forza 6 title, this is about testing the engine for Windows 10 as part of Microsoft's realisation that the vast majority of gaming people they sell something to are buying Windows, not Xbox. So it's not got the progression curve that allows you to get familiar with a vehicle on a selection of tracks before deciding to try another car as you slowly ramp up the speeds and so difficulty. The lack of many tracks is less of an issue because the price tag is free [you can pay cash for unlock credits for the cars - this is a lot less gross in a free product than a $60 game and is also entirely superfluous here as you will unlock every single vehicle]. Rather than unlocking cars with currency, you complete three objectives per event which gives you points and those points in an event unlock up to three medals - your medal total defines which cars you have access to. No purchasing is certainly a very different feel but that plus the lack of customisation (beyond paintwork there is nothing, no custom decals or performance parts for changing vehicle class or even moving inside the classes) left me far more detached from my cars. So the progression curve has been obliterated from every angle - hopefully just an experiment for this free cut-down edition and not a serious consideration for the next retail game. Considering the damage done to the series pushing F2P micro-transactions with a broken curve in Forza 5, hopefully they will keep looking to refine the series to mix progression with constant novelty. Along with the three optional objectives, which are a nice way of encouraging removal of assists or certain feats while racing, there is a main objective that gates "completion" of the event. Then your completion time and multipliers from the AI difficulty and assists settings adds up for a final event score. There is also a 4th, top score reward which turns the medals into a platinum - it would be nice if this had been set slightly higher as if you're playing without assists then your multiplier will quickly make it trivial to get this once you've grabbed the three challenges. The completion time or a fastest lap time should weigh more significantly on this total score calculation to provide real differentiation as if you've not got a challenge to hit a certain time then it almost seems as if lap times don't matter at all. This also infects the leaderboards for each event which are now all about your score and not about your lap time. Not only does this replicate the issues noted above about removing the focus on a single clear fast lap from the earlier implementations but it also doesn't even track clean vs dirty. It's just a single event and in that event you'll surely have drafted or done something to dirty some of it so everyone is unclean and it is entirely absent from the tracking. As I noted when recounting my history with the series, this goes completely against my impression of what was the core of the series. The ranking that put even the slowest clean lap above the fastest dirty one. 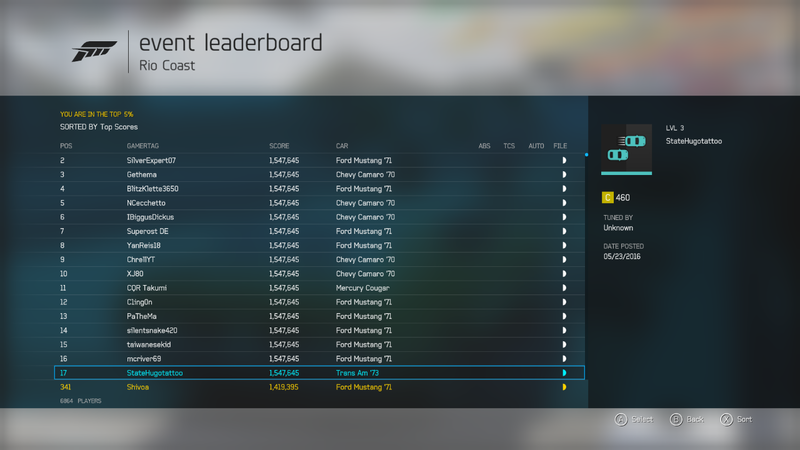 Not only are Car Clubs missing, hopefully an oversight from the cut-down nature of this game, but the leaderboards that do exist are ranking us on chasing challenges and abusing turns while minimising our assists. Those are still tracked by the leaderboards but as they act as multipliers for the score then they also push the rankings. As I got into Forza 6: Apex then I moved to manual transmission with clutch to enjoy a new challenge and assist both braking and acceleration but the score multiplier is now such that I have to really mess up to do badly on the leaderboards. This seems wrong; I no longer have an incentive to play through the campaign (what of it there is here) with a focus on clean fast lap times or even with the option of seeing those ranked once I finish an event. I do appreciate that since Forza 4 they have added a new top tier of AIs, pushing me away from "Pro" to challenge myself to be able to cut through the pack and get past an "Unbeatable" leader (who seems to be driving an automatic from what I can tell, which does mean they're not impossible to catch). The Drivatars seem totally unremarkable when you turn off the "aggressive" mode that ruins them but that's a big step up from Forza 5 - although you do have to wonder how a series spent so long working on a system that ultimately basically replicates the AIs before they started tuning profiles to try and match humans. One area where progress is desperately required is the weather and time of day. The problem with playing games in a post-DriveClub world is we know what fully dynamic time of day and weather provides to keep a track exciting, lap after lap. Now DriveClub was divisive, enough to break some reviewers into fabricating justifications for why they just didn't enjoy it, and wasn't aiming for the same level of sim as Forza. But every time I went to a night track or had to adapt to the deep water on a rainy tract in F6: Apex, I wished for the more dynamic way that DriveClub handled it. "You can lock it down to give you something to learn precisely but the game excels at making sure every lap can feel a bit different to keep you on your toes." This needs to be part of the next Forza. We deserve to be able to learn that a couple of laps into a 4pm race on this track then corners 4 and 6 will involve being blinded by a low Sun and for that to be a dynamic feature, not a static constant. The deep water here is great but how much better would it be if it came or went depending on conditions as you took a 10 lap event on the track. Bright day turning into pitch black with track-side lights to help guide your progress as your headlights fought against snow or fog that has just rolled in: this is something we can have with modern engines with no pre-baked lighting. There is great potential for the series here. A full game that steps away from some of these issues noted (some of which will almost certainly be rectified by a retail release with enough content to justify the price) could not only recapture any lost fans but also grab at all the PC fans of driving games or people who had a PC and a 360 but now only have a PC and PS4. The visuals are slick (perfectly fine on a GTX760) and the dynamic settings keep the main game's frame-rate up, even if it sometimes has to make the rear-view mirror into a slideshow to maintain it. 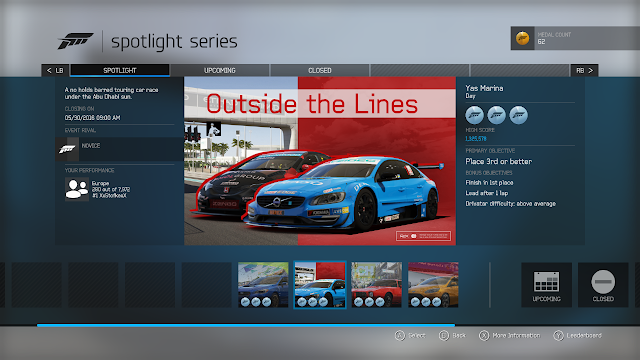 As to the base game: make the challenges and event points about buying car unlocks, not leaderboards; bring back Car Clubs and a focus on clean laps; add a fully dynamic system for track conditions; push in the expected features (multiplayer, visual and parts customisation, cars and tracks, a full career progression) and Forza Motorsport 7 for Windows 10 could be something to get very excited about. As a free preview, this does more than enough to justify anyone downloading it to take a look. Those with a racing wheel should keep an eye on the development blog for when that support gets added into the beta.